A fuel cell is a device that generates electricity by a chemical reaction. Every fuel cell has two electrodes, the anode (which is positively charged) and the cathode (which is negatively charged) Ryan O'Hayre, Suk-Won Cha, Whitney Colella, Fritz B. Prinz (2009) “Fuel Cell Fundamentals” , 2nd Edition, John Wiley and Sons. ISBN-13: 978-0470258439 Ryan O'Hayre, Suk-Won Cha, Whitney Colella, Fritz B. Prinz (2009) “Fuel Cell Fundamentals” , 2nd Edition, John Wiley and Sons. ISBN-13: 978-0470258439 Ryan O'Hayre, Suk-Won Cha, Whitney Colella, Fritz B. Prinz (2009) “Fuel Cell Fundamentals” , 2nd Edition, John Wiley and Sons. ISBN-13: 978-0470258439 . The reactions that produce electricity take place at the two electrodes. Every fuel cell also has an electrolyte, which carries electrically charged particles from one electrode to the other, and a catalyst, which speeds the reactions at the electrodes Xianguo Li, (2006) “Principles of Fuel Cells”, Edition 1. Taylor & Francis Group, 2006, ISBN-13: 978-1591690221 Xianguo Li, (2006) “Principles of Fuel Cells”, Edition 1. Taylor & Francis Group, 2006, ISBN-13: 978-1591690221 . Multiple fuel cells are usually assembled into a stack and generate direct current (DC). Hydrogen is the basic fuel for fuel cells, but fuel cells also require oxygen Smithsonian Institution, (2008) “Fuel Cell Basics”, http://americanhistory.si.edu/fuelcells/basics.htm Smithsonian Institution, (2008) “Fuel Cell Basics”, http://americanhistory.si.edu/fuelcells/basics.htm . There are several kinds of fuel cells, and each operates a bit differently. But, in general terms, hydrogen atoms enter a fuel cell at the anode where a chemical reaction strips them of their electrons. The hydrogen atoms are now "ionized," and carry a positive electrical charge. The negatively charged electrons provide the current through wires to do work. If alternating current (AC) is needed, the DC output of the fuel cell must be routed through a conversion device called an inverter. Oxygen enters the fuel cell at the cathode and, in some cell types, it combines with electrons returning from the electrical circuit and hydrogen ions that have traveled through the electrolyte from the anode. In other cell types the oxygen picks up electrons and then travels through the electrolyte to the anode, where it combines with hydrogen ions. The electrolyte plays a key role. It must permit only the appropriate ions to pass between the anode and cathode. If free electrons or other substances could travel through the electrolyte, they would disrupt the chemical reaction. Whether they combine at anode or cathode, together hydrogen and oxygen form water, which drains from the cell. As long as a fuel cell is supplied with hydrogen and oxygen, it will generate electricity. Alkali fuel cells operate on compressed hydrogen and oxygen. They generally use a solution of potassium hydroxide (chemically, KOH) in water as their electrolyte. Efficiency is about 70 percent, and operating temperature is 150 to 200 degrees C, (about 300 to 400 degrees F). Cell output ranges from 300 watts (W) to 5 kilowatts (kW). Alkali cells were used in Apollo spacecraft to provide both electricity and drinking water. They require pure hydrogen fuel, however, and their platinum electrode catalysts are expensive. And like any container filled with liquid, they can leak. Molten Carbonate fuel cells (MCFC) use high-temperature compounds of salt (like sodium or magnesium) carbonates (chemically, CO3) as the electrolyte. Efficiency ranges from 60 to 80 percent, and operating temperature is about 650 degrees C (1,200 degrees F). Units with output up to 2 megawatts (MW) have been constructed, and designs exist for units up to 100 MW. The high temperature limits damage from carbon monoxide "poisoning" of the cell and waste heat can be recycled to make additional electricity. Their nickel electrode-catalysts are inexpensive compared to the platinum used in other cells. But the high temperature also limits the materials and safe uses of MCFCs - they would probably be too hot for home use. Moreover, carbonate ions from the electrolyte are used up in the reactions, making it necessary to inject carbon dioxide to compensate. Phosphoric Acid fuel cells (PAFC) use phosphoric acid as the electrolyte. Efficiency ranges from 40 to 80 percent, and operating temperature is between 150 to 200 degrees C (about 300 to 400 degrees F). Existing phosphoric acid cells have outputs up to 200 kW, and 11 MW units have been tested. PAFCs tolerate a carbon monoxide concentration of about 1.5 percent, which broadens the choice of fuels they can use. If gasoline is used, the sulfur must be removed. Platinum electrode-catalysts are needed, and internal parts must be able to withstand the corrosive acid. Proton Exchange Membrane (PEM) fuel cells work with a polymer electrolyte in the form of a thin, permeable sheet. Efficiency is about 40 to 50 percent, and operating temperature is about 80 degrees C (about 175 degrees F). Cell outputs generally range from 50 to 250 kW. The solid, flexible electrolyte will not leak or crack, and these cells operate at a low enough temperature to make them suitable for homes and cars. But their fuels must be purified, and a platinum catalyst is used on both sides of the membrane, raising costs. Solid Oxide fuel cells (SOFC) use a hard, ceramic compound of metal (like calcium or zirconium) oxides (chemically, O2) as electrolyte. Efficiency is about 60 percent, and operating temperatures are about 1,000 degrees C (about 1,800 degrees F). Cells output is up to 100 kW. At such high temperatures, a reformer is not required to extract hydrogen from the fuel, and waste heat can be recycled to make additional electricity. However, the high temperature limits applications of SOFC units and they tend to be rather large. While solid electrolytes cannot leak, they can crack. Since fuel cells create electricity chemically, rather than by combustion, they are not subject to the thermodynamic laws that limit a conventional power plant (known as the Carnot Limit). Therefore, fuel cells are more efficient in extracting energy from a fuel. Waste heat from some cells can also be harnessed, boosting system efficiency still further. Fuel cells are employed in stationary power generation, portable power supply and transportation. Small, stationary power generators provide 0.5 kW to 10 kW uninterrupted power supply to households, shopping malls and data centers. Grid-scale fuel cell generation is also in development. Portable fuel cells are best suited for auxiliary power units (APU), portable devices, PC, smart-phone etc. The application of fuel cells in transportation represents the future for the automotive and computation industries. Buses, light vehicles (cars), UAVs and trains will soon be running on fuel cells. 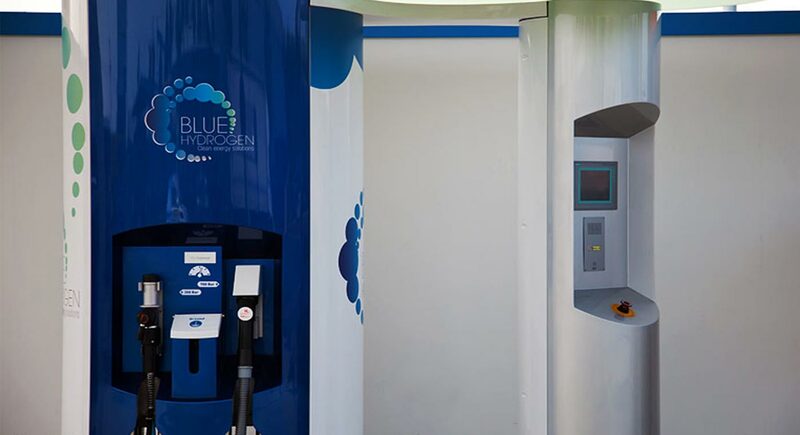 Another great appeal of fuel cells is that they generate electricity with very little pollution–much of the hydrogen and oxygen used in generating electricity ultimately combine to form a harmless byproduct, namely water. However, obtaining hydrogen is a challenge and can be energy intensive. Despite its many advantages, the commercialization of fuel cell technology faces many technical and economic challenges. The durability and cost of fuel cell systems represent the biggest barriers. Fuel cells are still in the ‘technology development phase’. Efforts are being made to reduce the cost and improve durability of fuel cells. Sorry, we do not yet have a video specifically for Fuel Cell. We are adding new videos to StudentEnergy.org weekly, but in the meantime check out this video on Hydrogen.